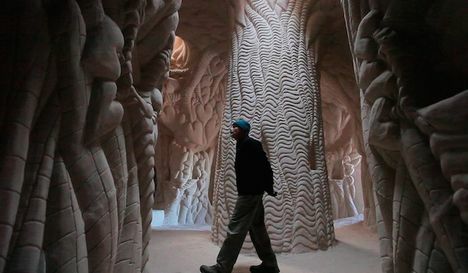 Ra Paulette digs cathedral-like, "eighth wonder of the world" art caves into the sandstone cliffs of Northern New Mexico. Each creation takes him years to complete, and each is a masterwork. 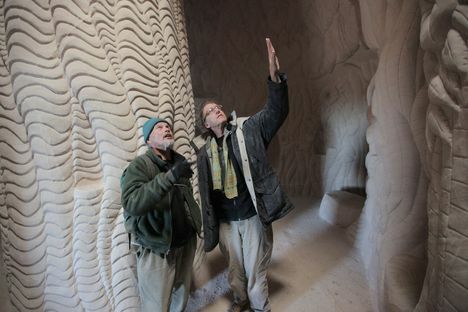 But patrons who have commissioned caves have cut off nearly all of his projects due to artistic differences. Fed up, Paulette has chosen to forego commissions altogether and create a massive, 10-year project, his magnum opus. We spoke to director/producer Jeffrey Karoff via email about the making of his Academy Award-nominated documentary short, CaveDigger. and I've directed fundraising docs for philanthropic organizations. But the core of my interest in documentary comes from photography. My grandfather started shooting slides of our family in the mid '60s. I picked up the mantle and every year I would compile a slide show of my own family images. I became obsessed with shooting ordinary moments, long before digital, when each image would actually cost you something to shoot. D: How did you first hear about Ra Paulette? What inspired you to start making a film about him? JK: I saw Shel and Liz's cave, the first one featured in the film, shortly after we bought a vacation house in the Northern New Mexico town where Paulette does much of his work. The story that Liz tells in the film, about having cancer while Paulette was creating their cave, was happening when I met her. Walking into that cave, my reaction was visceral. I think it affects everyone the same way. Not only is it extraordinarily beautiful, its very existence is extraordinary. I had never seen a space like that carved inside a mountain, and it was very much like entering a work of art. Its scale, its obvious visual appeal and the fact that I found Ra to be an enigmatic guy seemed that it might be all good stuff for a film. D: You spent 13 years making CaveDigger—a long time for any doc, let alone a short. I assume that finding funding was an issue, but I sense that capturing Ra's creative process must have been as equally painstaking for you as it was for him to create his work. Talk about the challenges of staying with your project for as long as you did. How did your vision for the project change over the time you made it? At what point did you sense a logical stopping point in the production process? week, which is when the documentary shooting began in earnest—on the day Paulette broke ground on his new cave. Filmmaker Jeffrey Karoff (right) with Ra Paulette. So in Ra I had a telegenic character and with the accident we had some drama, but it wasn't until Paulette introduced me to some of his past patrons—some of whom were not that happy with their interactions with him—that I understood the thematic material: an age-old conflict between artist and patron, playing itself out in the mountains of New Mexico. Exploring those relationships revealed the cost that an obsessive artist pays for his singular focus, and that became the core of the film. Because the film is biographical, the story had no inherent shape. I'd originally planned that Ra's new cave from its inception to its finish would create the form, until he told me it was a ten-year project. (He is now three-and-a-half years into it.) So I had to find another structure, which turned out to be like a funnel—that is, Ra's past actions and his advancing age were driving him to narrower and narrower choices, until he literally ends up by himself in the wilderness. started: with Ra breaking new ground. Financing, by the way, never entered into the equation. CaveDigger is entirely a credit card-financed venture, and most everyone who worked on it donated time and facilities. Optimus Editorial and POP Sound were exceptionally generous. D: CaveDigger brought to mind Thomas Reidelsheimer's 2002 documentary Rivers and Tides, about artist Andy Goldsworthy's ephemeral sculptures made from natural elements, as well as James Turrell's ongoing Roden Crater project, Michael Heizer's Double Negative and Robert Smithson's Spiral Jetty. Do those artists serve as inspiration for Paulette's work? Did you consider those artists as you were making CaveDigger? feeling. No doubt Ra is happy to have a film—now a recognized film—documenting his work. It remains to be seen if he will be anointed by the artistic establishment. I suspect that won't happen, but it's certain that his work has already reached a wider audience. Rivers and Tides was my original model for CaveDigger, but when I studied its structure I realized that it is episodic—a series of art pieces created, and then disintegrating, on camera. 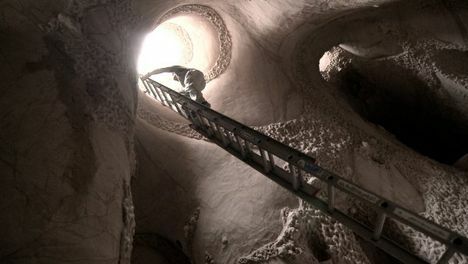 After reviewing some of the early CaveDigger footage, I saw that while Ra's finished caves have distinct looks, caves-in-progress all looked pretty much alike. Besides, each of Ra's works takes years, not hours or days. The grist was going to have to come from another source, and that turned out to be a story about relationships and obsession. D: As you've screened CaveDigger—whether on the festival circuit, or in screening rooms, or in living rooms—how have audiences reacted to the film? What has been most surprising or unexpected about their reactions? JK: I guess I'm most surprised that the film has been so well received, especially since it is something of a niche subject. Who ever knows, even if you like the work you've created? I'm gratified each and every time audiences laugh. I think CaveDigger has a lot of tragicomic moments, and it thrills me when others see the same. One of my favorite comments came from my nephew, an accomplished editor, who said, "I had a starry feeling in my stomach at the end of the film." A few friends and family wrote heartfelt, eloquent emails in appreciation, and those I cherish. your future plans for CaveDigger? 1:10 p.m. at the WGA Theater in Beverly Hills. For more information and to purchase tickets, click here. Thomas White is editor of Documentary.